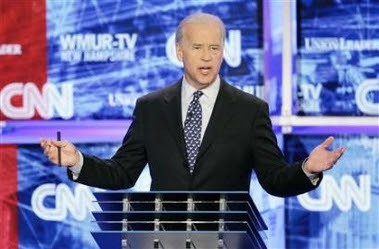 Presidential candidate Senator Joe Biden admitted meeting with the chief financier of the 9/11 hijackers in the days after September 11 after being confronted by We Are Change founder Luke Rudkowski in the press room following Sunday's Democratic debate in New Hampshire. According to the FBI and (Mysterious September 11 Breakfast Meeting on Capitol Hill) , Pakistani ISI General Mahmoud Ahmad instructed Omar Saeed Sheikh, the alleged assassin of Daniel Pearl, to wire $100,000 to alleged lead hijacker Mohammed Atta in the summer of 2001. The 9/11 Joint Inquiry chairmen are in "conflict of interest"
Was it "an intelligence failure" to seek the cooperation of the Pakistani government in the "war on terrorism" in an agreement brokered by the head of the ISI, a spy agency, which is known to support the Islamic brigades? "On the morning of Sept. 11, Goss and Graham were having breakfast with a Pakistani general named Mahmud Ahmed — the soon-to-be-sacked head of Pakistan’s intelligence service. Ahmed ran a spy agency notoriously close to Osama bin Laden and the Taliban." (Washington Post, 18 May 2002). While the Joint inquiry has collected mountains of intelligence material, through careful omission, the numerous press and intelligence reports in the public domain (mainstream media, alternative media, etc), which confirm that key members of the Bush Administration were involved in acts of political camouflage, have been carefully removed from the Joint inquiry's hearings. The following text published in Global Outlook , Winter 2003, provides details on the breakfast meeting hosted by Sen Bob Gram and Rep. Porter Goss on the morning of September 11. "When the news [of the attacks on the World Trade Center] came, the two Florida lawmakers who lead the House and Senate intelligence committees were having breakfast with the head of the Pakistani intelligence service. Rep. Porter Goss, R-Sanibel, Sen. Bob Graham and other members of the House Intelligence Committee were talking about terrorism issues with the Pakistani official when a member of Goss' staff handed a note to Goss, who handed it to Graham. "We were talking about terrorism, specifically terrorism generated from Afghanistan," Graham said. Again the political significance of the personal relationship between General Mahmoud (the alleged "money man" behind 9/11) and Secretary of State Colin Powell is casually dismissed. According to The Miami Herald, the high level meeting between the two men was not planned in advance. It took place on the spur of the moment because of the shut down of air traffic, which prevented General Mahmoud from flying back home to Islamabad on a commercial flight, when in all probability the General and his delegation were traveling on a chartered government plane. With the exception of the Florida press (and Salon.com, 14 September), not a word was mentioned in the US media's September coverage of 9-11 concerning this mysterious breakfast reunion. "A Cloak but No Dagger"
"Now the main question facing Goss, as he helps steer a joint House-Senate investigation into the Sept. 11 attacks, is why nobody in the far-flung intelligence bureaucracy -- 13 agencies spending billions of dollars -- paid attention to the enemy among us. Until it was too late. (...) Goss has repeatedly refused to blame an "intelligence failure" for the terror attacks. As a 10-year veteran of the CIA's clandestine operations wing, Goss prefers to praise the agency's "fine work." "Putting Two and Two together"
When the "foreknowledge" issue hit the street on May 16th, "Chairman Porter Goss said an existing congressional inquiry has so far found 'no smoking gun' that would warrant another inquiry." 8 This statement points to an obvious "cover-up". The smoking gun was right there sitting in the plush surroundings of the Congressional breakfast venue on Capitol on the morning of September 11.